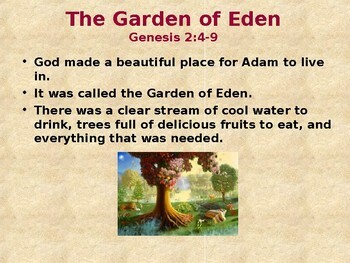 This is a 17 slide, highly animated, power point presentation on the Story of Adam and Eve in the Bible. Each of the slides are editable so you can modify the slides if you need to. 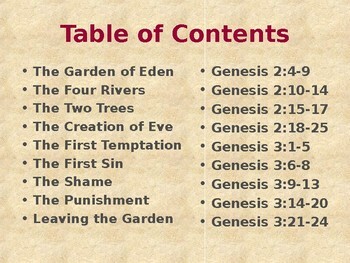 The story of Adam and Eve is a major one in the Bible. Their lives creates the purpose for the rest of the Bible. 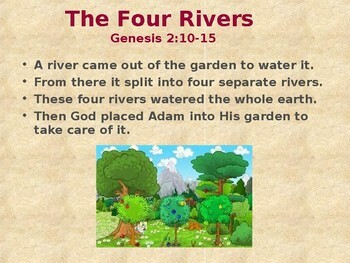 This Power Point Presentation breaks covers their story in an understandable format for children to understand. Presented in bullet form, each concept is supported by colorful, animated clip art, designed to get and keep their attention and open up discussion. 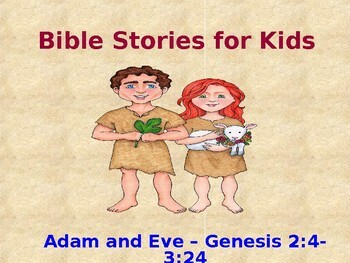 This is one of many power point presentations I offer in my store under the heading.... Bible Stories for Kids.